The interior design team working on the Jackalope hotel’s debut property in Mornington Peninsula, Victoria, chose baths and basins from Apaiser Bathware to achieve their design goals for glamour, sophistication and luxury. 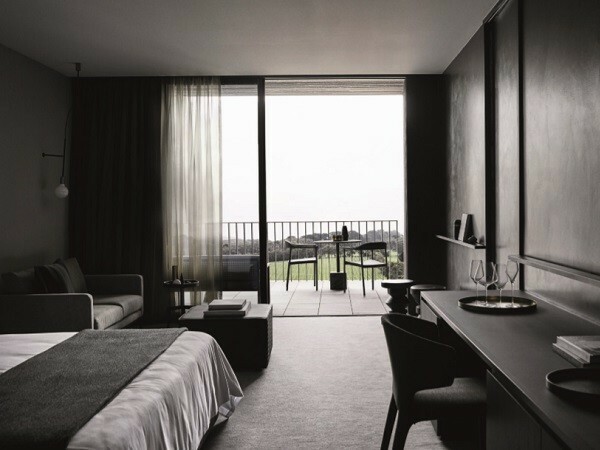 Designed to set a new benchmark for luxury accommodation in Victoria’s Mornington Peninsula, the stunning Jackalope hotel is located in a pristine vineyard and caters to a discerning local and international clientele. The interior design team selected Apaiser bathware to craft a sublime bathroom solution, using integrated basins and amazingly deep soaking baths in their unique dark graphite apaisermarble material. Combining the luxury appeal of composite stone, stunning bath design, and handcrafted finish, Apaiser’s bathware delivers a unique bathing experience that’s at once, contemplative and indulgent. Developed by Louis Li and designed by the Carr Design Group and multi-disciplinary studio Fabio Ongarato Design, the stunning new Jackalope is just an hour away from Melbourne and set amid Willow Creek’s 11-hectare vineyard.